Safe Treatment of Wasp or Hornet nests. Without being overly dramatic or resorting to scare tactics, we cannot stress enough just how dangerous a wasp nest can be! Especially so when someone inexperienced tries to tackle a nest. Every season we encounter nests which have been disturbed or interfered with by homeowners. It is a natural to attempt to solve the problem yourself. All but the most simple to treat nests usually end up in failure when attempting DIY treatments and the DIYer usually ends up getting stung. The usual DIY approach is to block the nest entrance with expanding foam or silicone sealant. DO NOT BLOCK THE ENTRANCE TO A WASP OR HORNET NEST! You will make the situation worse. Every wasp and hornet nest is unique, some are incredibly aggressive and some are very calm. You can never tell which way it is going to go. Some common wasps, in particular, are extremely defensive and will attack people for no apparent reason even when some distance from the nest. Are wasps aggressive after being treated? 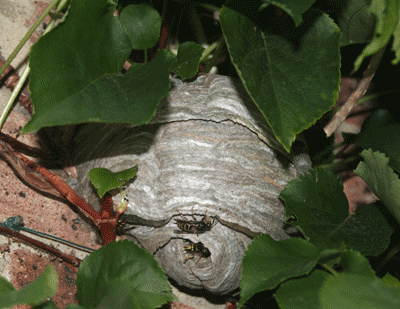 In almost every case after a nest treatment, there is an immediate build-up of wasps or hornets at the entrance to the nest. The process of injecting insecticide under pressure into the nest triggers a reaction from the wasps inside the nest and also from the wasps returning to the nest which become aware something has happened. They can become agitated and aggressive for a while after treatment. We believe that the initial treatment of the nest dampens the pheromone emitted by the queen and masks the peptide trail into the nest, thus returning wasps cannot pick up the scent of the nest and are alarmed or surprised upon their return. For a brief while, there is a build up of wasps outside the nest entrance, but generally, after 20 minutes or so, they settle down and start entering the nest as usual. Nest size dictates the size of the build-up after treatment. Big nest = more wasps! As wasps enter the nest, they help distribute the insecticide around the nest, affecting all the occupants of the nest. We advise customers to close any nearby windows and doors then stay away from the area of the nest for a brief time after nest treatment. Dealing with dead Wasps or Hornets after treatment. Be aware that dead wasps or hornets can still sting if they are stepped on with bare feet. If you have had a wasp nest treated recently, the chances are that there will be dead wasps on the ground. Dead wasps are very difficult to see, especially in grass. If you have children, make sure that they always have some protection on their feet when playing in the garden after a nest treatment. How to deal with a Wasp or Hornet nest inside a house. 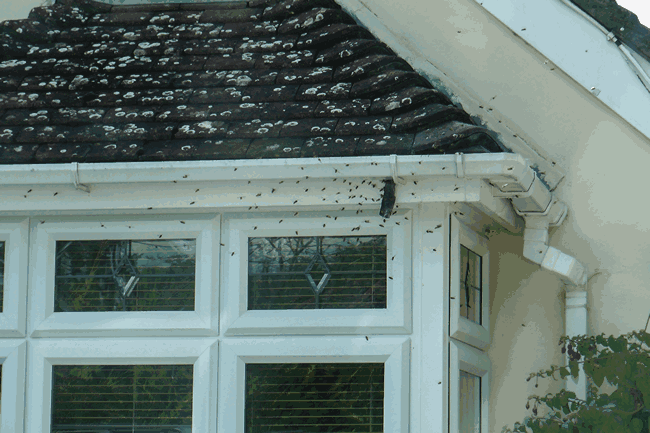 If you have wasps that are gaining entry inside the house, you will need to locate how/where they are getting inside. Sometimes it is just a small hole or gap that can be temporarily taped over to prevent them from gaining access until we can treat the nest. Take a look around the outside of the house, paying particular attention to the roof; you will very quickly notice the activity and be able to pinpoint the nest location. Watch our wasp nest identification video which will educate you on what to look out for. From there, you can usually pinpoint how they are working their way inside. Any holes in ceilings where pipes pass through, poorly fitting loft hatches or even some light fittings can present an opportunity for wasps to gain access inside your home. Be aware that wasps (like most insects) are attracted to light. If there is a gap in your ceiling where light can shine upwards into the loft space at night, wasps will be attracted to it. Older type downlights can be a particular problem as they emit light upwards as well as downwards. In more severe cases, (usually older houses) wasps and hornets manage to build a nest inside the house and have gone unnoticed until the residence start getting stung. If you find yourself in this situation, the best course of action is to try and locate the area or room that the nest is in, open the windows, shut the doors and keep everyone out of that room. Allergic reaction to wasp or hornet stings. As stated on other pages of the site, wasp and hornet stings can produce an Anaphylactic Shock in some people. You will not know if you are allergic to wasp or hornet venom until you are stung. Anaphylactic Shock is an allergic reaction. Wasp, Hornet and Bee stings can all produce this effect. If you are stung and feel unwell, seek immediate medical attention. Do not leave it!. It is a severe condition, producing low blood pressure and inflammation of the lungs.